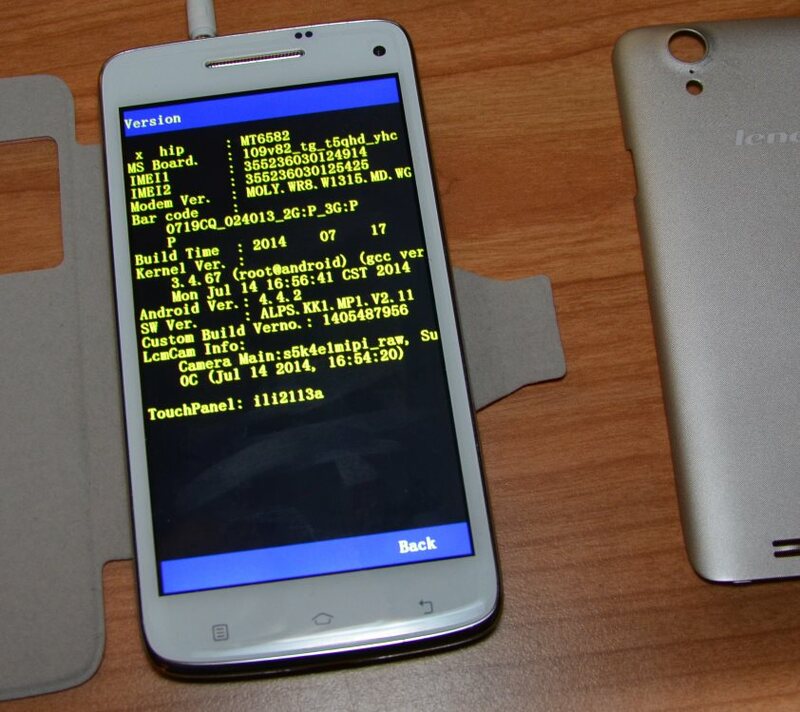 The smartphone labeled as "Lenovo S960S"
On AliExpress a company sells these so called "Original Android 4.4 Phone Lenovo S960S"
BEWARE! THIS PRODUCT IS NOT WHAT IT LOOKS LIKE! Youtube video of unpacking the Lenovo S960S. 2014 aug 12 - I bought this smart phone too. As it stands, it looks like some Android benchmark apps (AnTuTu, CPU-Z) report incorrectly the processor as a "MT6592" (octo-core 1900 MHZ) while in reality it is a MT6582 (quad-core 1300 MHZ). It looks as if there is some software on the phone, thats is changing output of some benchmark programs. As you can see here there are values "origin" and "changed". Coincidently the processor speed reported by AnTuTu is 1900 MHz, while the reported processor speed of another benchmark is 1300 MHz. Strangely the name of AnTuTu also appears on the 3rd line. It looks like the results of a number of known benchmark / diagnostics software is hacked on the fly to change its values to other values. Googling for "e2109v82_tg_t5qhd" i found a forum where a Czech engineer called it "agold_cheat_evaluating_software". It sounds just like it. I don't know how he gets this name. As a matter of fact, there are a few apps running that refer to "agold": They are called "AgoldWallPaper" and "AgoldFactoryTest". There is mention all over the internet about "agold_cheat_evaluating_software" in connection to fake specifications of smart phones. A number of known benchmarks give incorrect results! There are more differences between what the seller says and what some of the unknown benchmark / system diagnostics software is telling. I am carefull to not mention the name of the software I use, because it is very likely the chinese company will adapt there software so that other software will also report false values. Look at this Youtube video to find the names of a few seemingly trustworthy software, that give the right information. So what are the values that are reported by listed software AND advertised by the seller? There is also a property value of "e2109v82_tg_t5qhd" that seems to be changed to "e2109v82_tg_t5fhd". How's that, Google? Also the primary camera seems to have 5 megapixels, not 13 MP. Someone placed at pastebin almost exactly the same file ! So I placed this file at Pastebin also for everyone to view. When I boot the phone into Factory Test Mode (power off, then power on with "power" and "volume up" button pressed), go to Version , the phone identifies its CPU clearly with "MT6582". All Lenovo phones have the brandname at front. This one doesn't. The phone was packaged in a generic blue-green box labeled "Android"
A proper manual was missing. Lets call it a "W82".